In September 2015, disability activists held a protest outside the Irish Parliament (Dáil Éireann). They argued that the Government’s plan to invest an additional €450 million in institutional care was a backward step, ‘a kick in the teeth’ for a group that had ‘escaped’ similar care in the past. In contrast, protesters emphasised the need to increase the allowances paid to people with disabilities, as these allowances facilitated them to ‘live with dignity and respect’ within the wider community. 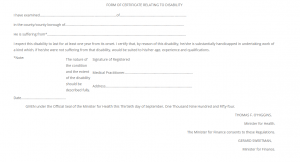 The provision of disability allowances has a relatively long history in Ireland, beginning in 1954 with the introduction of the Disabled Person’s Maintenance Allowance (DPMA). Yet, the payment has remained a topic of controversy throughout the second half of the twentieth century, with its role continuing to spark debate into the twenty-first. Subject to lethargic administration, insufficient inspections and infrequent increases, disability allowances have served as a microcosm for wider issues plaguing the Irish Social Welfare system. Yet, the topic remains virtually unexplored within academia, excluded from seminal analyses of Irish social welfare services like Mel Cousin’s The Irish Social Welfare System (1995). This consideration explores some of the challenges underlying the allowance during its early years from 1954-61. Plans to introduce an allowance for the long-term disabled had been discussed since the foundation of the Department of Health in 1947. Proposals noted that an allowance should be introduced swiftly to facilitate the retention of the disabled within the family home, thus reducing pressure on institutional accommodation. 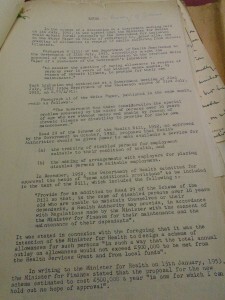 Legislation for the Disabled Person’s Maintenance Allowance was introduced in 1954, but had been preceded by an extended bureaucratic ‘tug of war’ between the Departments of Health and Finance. The proposal was included in a Department of Health White Paper in July 1952, where it was recommended to address ‘cases of persons over 16 years of age who are without means and unable by reason of chronic illness or disability to provide for their own maintenance’. The allowance was then legislated for within the 1953 Health Act. Yet, it was introduced despite sustained resistance from the Department of Finance and an almost total lack of planning from the Department of Health. Inter-departmental memos noted how all estimates were based ‘on sheer guesswork,’ while the Minister for Finance wrote to the Department of Health, pleading that they defer the scheme ‘until national output increases, prices and costs are stabilised and conditions generally become more favourable’. Despite such issues, the Department of Health introduced the allowance and payments commenced from February 1955. Its introduction became a cause of long standing annoyance within the Department of Finance where, in 1960, officials continued to refuse to increase an allowance that was ‘more or less foisted on us willy nilly’. MacEntee’s statement underlined a system where those with a disability were left largely to fend for themselves. Rather than serving as one support within a range of welfare services, the payment of a disability allowance demarcated the end of the state’s responsibility for their welfare. The introduction of the disability allowance scheme in 1954 was a clear evolution within the Irish welfare system, which remained noted for its underdeveloped social security infrastructure. 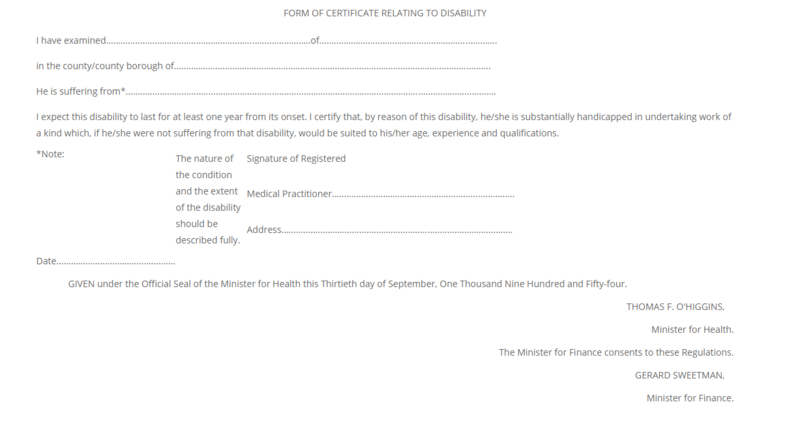 The introduction of this new welfare payment for the disabled was condemned as a ‘leap in the dark’ in the Sunday Independent newspaper, with even the Minister for Health noting its introduction was not based ‘on other countries that would have been a guide to me.’ Unlike the United Kingdom, which saw the gradual expansion of disability services within the general mechanisms of the welfare state, the Irish state introduced the DPMA payment rapidly, but then failed to reform its administrative anomalies until its incorporation into the remit of the Department of Social Welfare in 1996. This ‘leap in the dark’ policy measure was quickly accepted across the political spectrum as a necessary and useful scheme, with members of parliament campaigning for increases to the allowance throughout the 1950s and 60s. However, the disability allowance also remained a limited financial benefit within a field devoid of state resources for the disabled. In the absence of other state services, the voluntary sector evolved to take an increasingly prominent role in the provision of services throughout the latter half of the twentieth century in Ireland, an effort culminating in the work of voluntary sector groups in organising Ireland’s hosting of the Special Olympic Games in 2003. Interrogating the genesis of the DPMA can appear an abstract topic, divorced from the ‘lived experiences’ of those with a disability. Yet, an interrogation of the debates and discourses around this allowance offers the historian a greater insight into the popular conception of the disabled, as well as reflecting back on the wider working mechanisms of the Irish state. David Kilgannon is a Wellcome Trust PhD researcher in the Department of History in the National University of Ireland, Galway. 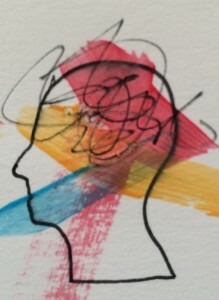 His research examines the varied experiences of the intellectually disabled in Ireland across the latter half of the twentieth century. 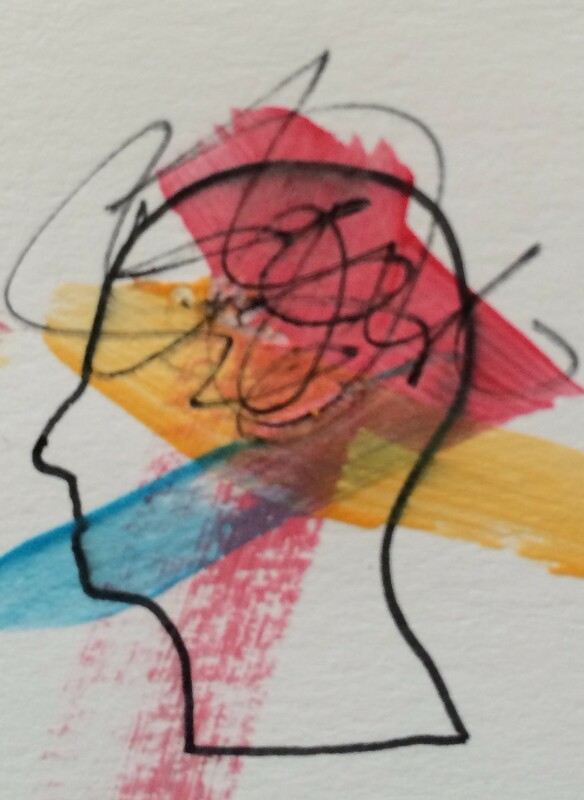 He was previously a Hardimann Fellow and a Wellcome Trust MA student. ‘Memorandum for the Government,’ 13 August 1947, NAI TAOIS-S12573-B. Department of Health, Proposals for improved and extended Health Services (Dublin, 1952), 16. ‘Memorandum,’ S.72/7/53, 7 November 1953, National Archives of Ireland (FIN-S72-7-53). Department of Finance, Meeting Minutes: 25 July 1960, NAI: FIN-S72-7-53. ‘New Plan to aid Disabled’ The Irish Times, 15 July 1953, 1. ‘Daíl Query on aid for the disabled’ The Irish Press, 5 May 1953, 8. ‘Allowances for Disabled Persons’ The Sligo Champion, 22 February 1957, 11. 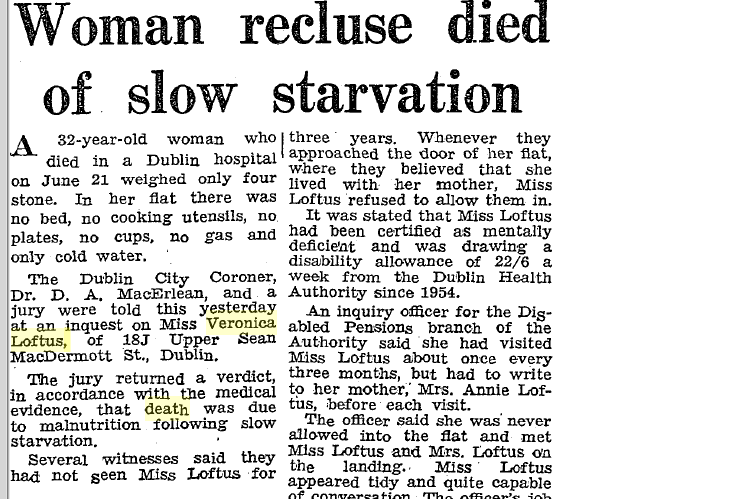 ‘Woman of 32 died of slow starvation: Had disability allowance’ The Irish Times, 21 July 1961, 11. 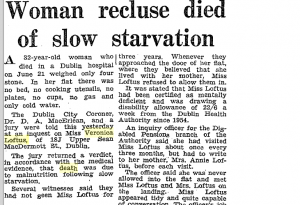 ‘Woman recluse died of slow starvation’ Irish Press, 21 July 1961, 7. Sean MacEntee, Dáil Debates 191, col. 1867, 26 July 1961. Peter Kaim-Caudle, Social Security in Ireland and Western Europe (Dublin, 1964), 10. Liam Skinner, ‘Health Act, in full, may cost rates from 5- to 10-’ Sunday Independent, 28 March 1954, 4. James Ryan, Dáil Debates 140, col. 1134, 14 July 1953. This entry was posted in Uncategorised on 2nd November 2016 by Grainne Goodwin.